June 30, 2016 11:00 am / 4 Comments on 1,004 Miles… and Counting. Yesterday’s ride was as good as it gets. After a great club ride on Tuesday, it was a perfect night for a victory lap. I actually tried to take a full hour to make it back to my driveway, covering the 16 miles sitting up to look at everything I normally miss with my head down. The wind was negligible, out of the west-north-west in the single digits. Not a cloud in the sky. My bike is perfectly tuned and running like the precision machine it is. No creaks, clicks, ticks… just the whir of the chain as I fly down the road. Wait, no, no, no flying down the road. I purposely ignored the computer, or at least tried to. Just spinning. Spin, spin, spinni… Dude, who am I kidding. I look down at the computer. 18.3 mph. Into the wind. Oops. Downshift. 17.5… That’s better. I couldn’t believe how many cyclists I was seeing! Normally I’m lucky to see one, I saw three before the halfway point – and my buddy Mike in his truck. 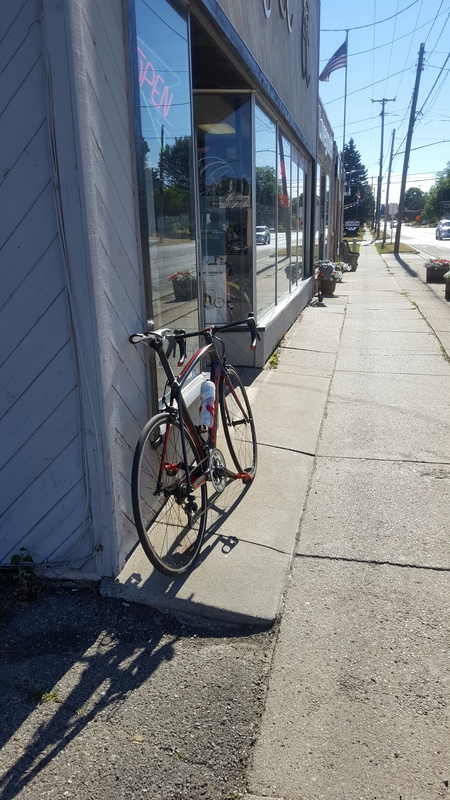 I stopped at the shop on my way home… I had five miles to go. 999, on the nose. With the wind at my back I tried to keep it slow but I checked twice and I was north of 21 mph. I chilled out once I headed south, back home and pulled into the driveway at 55m:17s. It’s official. Unless I’m with my kids, my Venge can’t go 16 mph. It’s simply too fast*. If you look real close, that’s butter pecan ice cream… Better than chocolate milk, methinks. *Too fast is relative. If I’m climbing a 6% or better grade, I’ll guarantee you it can go slower than 16 mph. In fact, I believe I’ve had it down to 4 or 5 mph climbing an 18% hill. Forgive me for generalizing… I don’t know how slow I was going – I didn’t bother looking at the computer… I had my attention on the hill. I’m going to pass 1,000 miles on my bike for the month of June in about an hour and a half. It took me 55 hours to get there, or just over an 18 mph average. This includes all miles – recovery miles, fast miles and more than 170 of the toughest, hilliest miles I’ve ever ridden. Do the math and it’s less than 2 hours a day, about 1:45 a day, average. That’s not how I got there though, I don’t have that much time during the week to blow on a bike because, sadly, I have a job. Or should I say, I haven’t found anyone crazy enough to give me a couple hundred grand a year to ride a bicycle. Before I get into the breakdown, let add this: I only took one day off this month. That’s it, one day. I’ve ridden every single day other than the day I took off so I could drive up to a two-day 170 mile cycling tour. Also, I’ve only hit 1,000 miles two other times in the years I’ve been cycling (both last year) – and the second one, in September, was only because I did 385 miles in the first week of the month. The first, August, was done because I ride so many stinkin’ centuries in August (one almost every weekend in the month). This 1,000+ mile month was special because there was only one century the entire month, though I still hit a lot of long miles on the weekends, usually between 50 and 75 miles each day. 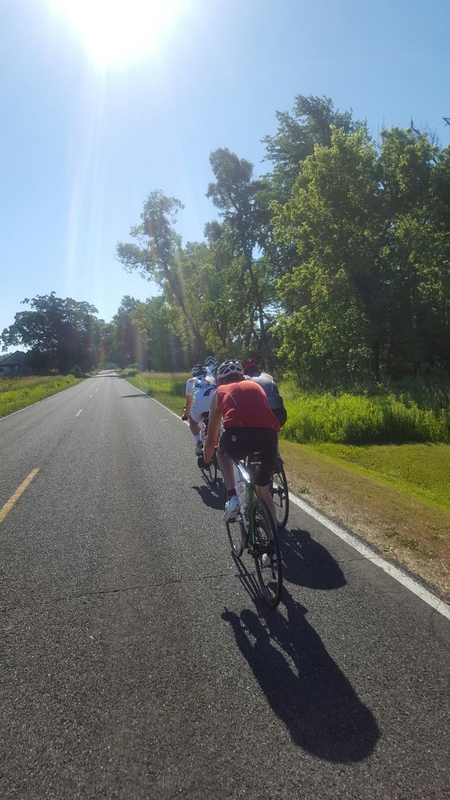 While I love the long mileage days (especially anything between 60 and 75 miles), I rarely put in more than an hour a day into cycling during the week (Tuesdays are the exception – 2 hours for the club ride). My trick this past month was to go decently long on both weekend days. Other than 40 mile Tuesdays and 110-175 mile weekends, I’m only riding 16-20 miles a day (that’s 50m – 1h:05m a day). In other words, my fitness is relatively easy to fit into my schedule, and I’m a nut. Wait, I think they call us “avid enthusiasts”. If you think I’m nuts, I’m okay with that. If you don’t think I ride enough, well try coming out of retirement and properly tending to your family before you start slinging mud. On the other side of that, if you’re thinking “I can’t do that”, relax… I didn’t think I could either, especially when 100 miles in a week was a lot. I would suggest you not sweat it and do your best. I am sure surprised where my best took me. Sometimes a good idea needs a little chance, maybe call it fate, a nudge, to get started. There were twice as many of us as there were of them. We started out fairly easy at 19 mph but we built up quickly and had a decent 21-22 mph pace heading into the north wind. I didn’t think twice about taking a turn up front, never struggled to latch back on after a turn, the neutral zones actually worked, and I rarely felt taxed enough to go all the way to the back. It was a perfect ride. We all, including Mrs. Bgddy, finished as a group, I did more than my fair share and I had a big smile on my face the whole way. I did not take the sprint. Even my wife beat me to the line. I handled the lead out. Sometimes you’re the sprinter, sometimes you’re the lead out. I was perfectly happy with it. We all laughed and shared fist bumps after the ride – and we all agreed this is the better way to enjoy a Tuesday night. The B Group is born. Oh, and we finished just shy of a 21 mph average. We actually finished faster than if we’d started with the racers, done the whole 30 mph thing, and gotten spread out and dropped along the route. More than 29 miles in 1h:22m. Dinner at the Cafe was extra good last night. I even had a butter-pecan ice cream cone to celebrate. Well, that’s the excuse I’m sticking with, anyway. I walked out of my office after a brutal run-of-the-mill Monday… The door opened with a whoosh and I was hit in the chest by the heat. As I drove home I could feel the day weighing on me. My shoulders slumped a bit after I settled into my long stretch on the freeway. It was five degrees warmer at home. Less wind. I was sweating by the time I hit the front door, less than 50 feet from my car. It was that hot. I sat down on the couch, AC blasting cool air at me… after reading two posts I fell asleep. Fifteen minutes later, on the nose, I woke up with a decision to make. It’s so freaking hot out there and my legs are fairly smoked after a big 250+ mile week during which I didn’t even need an 80 miler, let alone a century (I almost always need one century in there to make 250). In other words, a day off could easily be justified. My last true day off the bike was 10 or 11 days ago, I think. I walked into the bike room and looked at my Venge. Dude. For the first time, I think since I started cycling, I really didn’t care how long it took to complete my 16 mile loop. The wind was ridiculous. Instead of cooling me down it was like being blasted by a 20 mph furnace out of the west. I just went to it. The second mile, heading west, made me laugh out loud. 15 mph, in the drops and spinning like I meant it. Later on, heading west, was laughable as well. 27 mph, keeping up with traffic, soft pedaling. I rolled into the driveway smiling, 16 miles on the nose, in an easy 55 minutes. It wasn’t my slowest ride on a road bike, that goes to riding with my kids, but it was among my slowest solo rides on the Venge ever. My gut, that fat guy inside me just looking for a flaw in the armor, hates my Venge. It hates my love of cycling. It hates that I’d rather ride slow than not at all. It hates that there’s no quit in me. My gut hates that there are no flaws in the armor. The rest of me digs it though. Is that Noodle Salad Vegan, or are You an Idiot? June 27, 2016 1:53 pm / 4 Comments on Is that Noodle Salad Vegan, or are You an Idiot? Donald Trump, Hillary Clinton, Brexit…. Guns and Ammo. How often do we see simple political issues turn ridiculous, only to have one side resort to calling the other names? He’s a racist because he thinks the US should have the same immigration policy as Mexico (i.e. If you’re caught here illegally, you go to jail or prison till we get around to shipping you home). She’s an liar because she attacked Republicans for proposing a Bill that would have fixed the loophole in the No-Fly, No Buy Law that the Democrats love so much – that loophole being a current secrecy and lack of transparency, without being able to face one’s accusers (the government) and mount a defense so that one may be removed from that list (which currently is exceptionally costly and very difficult). Brexit… The Leave campaign was based on lies while the Remain camp simply resorted to exaggerations. Give me a break. Exaggeration is lying, sparky. I’m not immune myself, which makes writing this post extra fun. I constantly make fun of vegans as intellectually challenged. Or better, how about the new trend in addiction treatment, “evidence-based” treatment alternatives? That one is probably my favorite of late because it is so virulently dishonest at its core. There are all sorts of warm and fuzzy words jumbled together to describe what “evidence-based” is, but the simple way to put it is this: Evidence-based recovery is not a Twelve-Step Program and is devoid of that which is known as a Higher Power. My question is this: If you’re so intelligent and your idea of the way things should be is so excellent, why can’t you just come out and say it with a straight face? This is the “why” behind evidence-based recovery: We can’t regulate AA because there are no leaders, we can’t make money on AA because it’s free, and we can’t make it so only someone with a degree can administer it because any addict, regardless of educational background, can help another addict to recover simply by describing their own experience, strength and hope… So we have to demonize and get rid of Twelve Step Programs so we can administer recovery from on high. Basically, we’re going to do the exact same thing but we’re going to call it something else with fancy lingity (language, I like the word lingity because it’s funny) so we can make money off of it. Look at the gun legislation that the Democrats shut the government down over last week with their insignificant sit-in. After all of the back and forth over the last twenty years, they finally had something that we all could agree on in “No-fly, no-buy”. Even the NRA, given the right legislation, would have backed it. Democrats wouldn’t have it though – and it’s not because they’re stupid. It’s because they’re smart. Democrats want a law that they can bend and manipulate later on so that they can eventually bring about an end to private ownership of weapons with a simple change of rules. This would be the easy end-around to actually crafting real legislation that a fair majority of people could agree with. Another favorite of mine is “Universal” background checks. They’re not universal, they’re “Federal Background Checks”. Why use the word “Universal”? To spread ignorance among the followers. The other side won’t let “Universal” background checks pass because they know what’s next. The bureaucracy simply changes the rules by executive fiat to make it so difficult to pass a background check that you effectively can’t buy a firearm anymore. They end-around the Second Amendment of the Constitution the easy way, simply by passing a Law taking control of background checks that currently reside with local and State governments. Of course, you’ll never see that on the brochure though, because only the most hyper-partisan hack would agree that this was a good thing. This provides the perfect backdrop for a clash amongst the citizenry. I’m mad, you’re mad, I’m an idiot, but so are you. Exactly the way politicians like President Obama want it… That’s the only way they can control us. When we’re pissed and ignorant at the same time. …and if you don’t agree with me, you’re an idiot. Or I am. Good Time, Noodle Salad and a BUNCH of Miles. June 26, 2016 11:00 am / 10 Comments on Good Time, Noodle Salad and a BUNCH of Miles. 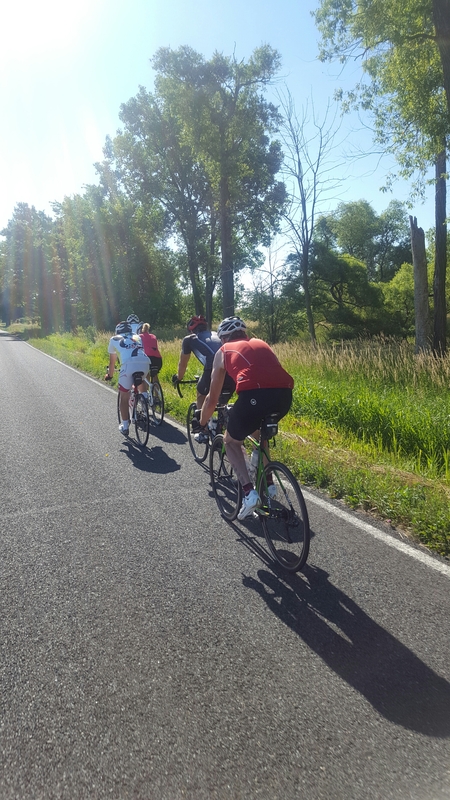 A 74 mile ride yesterday, a ride that by all accounts should have been a great, fairly easy 20 mph ride, ended up taking a lot of want to by the time we were done. I started struggling at around 48 miles… Probably a bit of over-training. After a shower and a nap, my wife and I took the kids out to a friend’s house. After that it was a nap before we were off to Diane and Adam’s house for a cookout, a lot of laughs and getting to know a couple of longtime club members. My contribution? You know it. Noodle Salad. As good as I could hope for. After today’s 55 that’s 258 for the week and I only need 67 more to crack 1,000 miles for the month. It’ll be tight but I should be able to get it done. Today is a party day… It’ll be a nice breakfast for lunch followed by an enormous nap. The clouds are already building for rain. Some Ideas for Accessorizing a New (or old) Bike. June 25, 2016 11:00 am / 7 Comments on Some Ideas for Accessorizing a New (or old) Bike. The boys at Velominati have a list of rules as long my arm about how to accessorize a bike and you, for cycling. In the end, the rules are so restrictive, you end up looking good but there’s no individuality, with the possible exception of your socks – as long as they’re no less than, but between, 3 inches and 5 inches above your ankle. You end up looking like everyone else, which can turn off a certain type of freedom-loving cyclist. The question is, how far can we go, how far can we push the rules of taste before we look like a mish-mash of hippie ridiculousness? Or worse, like we don’t care at all?! First, I am not about to tell anyone what they cannot do. If your idea of fashionable cycling is looking like a circus clown (no offense intended toward circus clowns, Jim Hazard was a very good friend of mine) on a bike, it’s all good. Do what makes you happy! Doesn’t that hurt, to ride on the tops with no bar tape? Dude, who cares! The style watts are off the chart! Let’s start with the chain rings. Mine are original equipment while the crank is an upgrade. If money were no object, and it is with me, I’d have black S-Works chain rings on there to keep everything black. The stem, an FSA carbon wrapped aluminum piece of awesomeness actually had a purpose. It’s a long story, why I went with a stem that’s got white on it (I used to have red and white logo stickers on my wheels, the whole thing worked really well) but it’s little enough that everything still works. Not bad, but I think two red cages stick out just a touch too much. For the 5200 I went all black. I tried out a red and black cage at the shop but it just didn’t work with all of that black. For this bike, I absolutely had to stick with black – and I think it’s inarguable that it works. Notice, all black with white lettering. 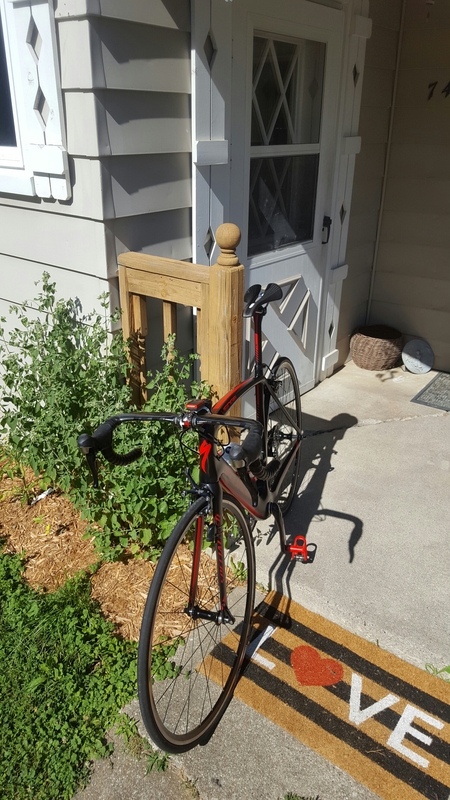 Originally my wife wanted black cages to match the saddles, bars, bar tape and I agreed. The bike wasn’t done at the shop so we were up there picking out the accessories (black computer, bar tape, etc.) and when we got to the cages, we set the black ones up there just to see what it would look like and they absolutely didn’t pull everything together – they looked out of place entirely. We set the white up there and that was much better (I’ve also since properly synched the cranks, the front was one tooth off from the back in this photo). Back in those days I was trying to rock the Red, White and Blue. Looking back, I don’t think it worked all that great because the red was wrong, but I gave it a go and the bike certainly was different. The point is to make your bike your own, an extension of your individualistic personality, while still keeping it cool. 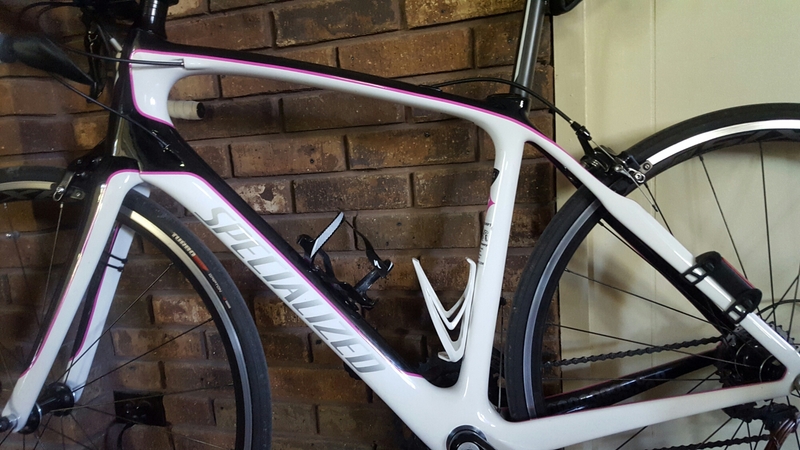 When we’re talking about road bikes you’re going to drop anywhere from a thousand, up to ten grand for a bike… Why would you want it to look like every other bike like yours our there?